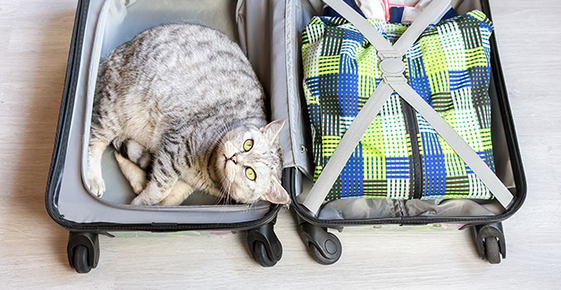 Planning and preparation are necessary when traveling with family pets. Consider whether your pet is comfortable when traveling. Some animals, like some people, function better in familiar surroundings. A car-sick animal can make a trip miserable for everyone. Some ill or physically impaired dogs and cats cannot withstand the rigors of travel. If this is the case, discuss options such as using a reliable pet-sitter or a clean, well-managed boarding facility with your veterinarian. If you will be staying with friends along the way, be considerate. Find out in advance if the pet is welcome. The same goes for hotels, motels, parks, and campgrounds. Always check whether pets are allowed or kennel facilities are available. If the pet must be left alone in a hotel room, place a "Do Not Disturb" sign on the door and inform the maid and the front desk. Consider bringing along a portable kennel for use in hotel rooms or the homes of friends or relatives who are not comfortable with your pet loose when no one is home. A few general tips apply whether you travel by car or plane. Be sure your pet is properly identified with a current tag or a microchip. Grooming (bathing, combing, trimming nails) before a trip, plus having its favorite food, toy(s), and dishes available will make your pet more comfortable. Have both proof of rabies vaccination and a current health certificate with you when crossing state or international borders. Before undertaking any trip, consult your veterinarian to be sure that all required vaccinations are up-to-date and to receive a health certificate within ten days of travel.